I’m not a huge fan of parenting manuals. You can probably tell from the books I share here that I love my craft books and the odd piece of fiction. At the end of last year HarperCollins asked if I wanted to take part in in their 31 days of inspiration and ‘live a book’ in January. This month they are bringing 31 of their inspiring books together covering areas such as; professional development, parenting tips, health, exercise and general well-being. Some of the ideas in these books involve a complete overhaul, whilst others require small changes to effect positive outcomes. I chose to review The Playful Parent: 7 ways to happier, calmer, more creative days with your under-fives by Julia Deering. I loved the sound of this book and although I don’t look for parenting advice I’m always looking for ideas and inspiration to be creative with my children who are 3 and 4. This is a practical activity-led parenting guide and shows how to get young children involved and learning, thinking and growing, helping and cooperating. I’m lucky in that I love to craft, my children love to craft and I’m part of a great community of creative bloggers. I enjoyed reading this book and wish it had been around when my children were smaller. I’ve learned what works for us through trial and error but this book is packed full of ideas, advice and information as to the positive benefits of living creatively. I found we already do a lot of the suggestions and reading through the pages made me realise that there is creativity in every day and we are probably do lots of things without even thinking about them. We’ve been quite smart with our living room and children’s bedrooms. Toys are rotated regularly, they are stored in boxes which are easily accessible, some larger toys are semi-permanently out and we always have our home made Lego table out which is a brilliant invitation to play. Each child has a reading corner to escape to when they want some quiet time. Chapters include 10-Second Set-ups, Choes: Not Bores, Invitations to Play, Invitations to Create, Make and Take, Stay and Play and Sanity Savers. The book includes over a hundred uncomplicated and irresistible activities for your 18 month – 5 year olds. 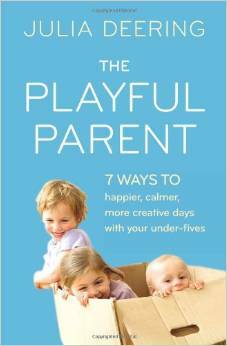 The Playful Parent: 7 ways to happier, calmer, more creative days with your under-fives by Julia Deering is priced £10.99 and available from all good bookshops.